This Bescor LED-70 Dimmable 70W On-Camera LED Light Kit includes the LED-70 on-camera, dimmable, daylight-balanced 6500K LED light and a swivel ball mount. Suitable for both video and DSLR cameras, the LED-70 combines bright output with a compact form factor. Use the included sturdy metal ball head mount to attach the light to your camera's shoe mount or 1/4"-20 cage thread. The light is powered by either four standard AA batteries or an optional AC power adapter. The light includes a clear frosted filter for softening glare and an amber 4300K correction filter for shooting indoors. The Bescor LED-70 is an on-camera, dimmable, daylight-balanced 6500K LED light designed to combine bright output with a compact, highly flexible form factor. Powered by either four standard AA batteries or an optional AC power adapter, the unit's 96 LED bulbs produce an ultra-bright, 70W-equivalent beam with a reach of up to 30 feet. Suitable for both video and DSLR cameras, the LED-70 includes a clear frosted filter for softening glare, as well as an amber 4300K correction filter for shooting indoors. LED technology offers lamp longevity, low power consumption, daylight-balanced illumination, and never gets hot to the touch. This light utilizes either four alkaline AA batteries or rechargeable NiMH AA batteries. With an optional 6 VDC/1.5A adapter, it can also run off AC power. The LED-70 offers a wide array of 96 individual LEDs for a wide beam that illuminates up to 30 feet. Dimmable from 100 to 20%. The included 4300K amber filter provides a softer, more natural lighting effect, while a frosted clear filter helps smooth and even out the light's tone while reducing glare. Filters are easily removed from the unit's housing by sliding them in and out of the built-in filter holder. 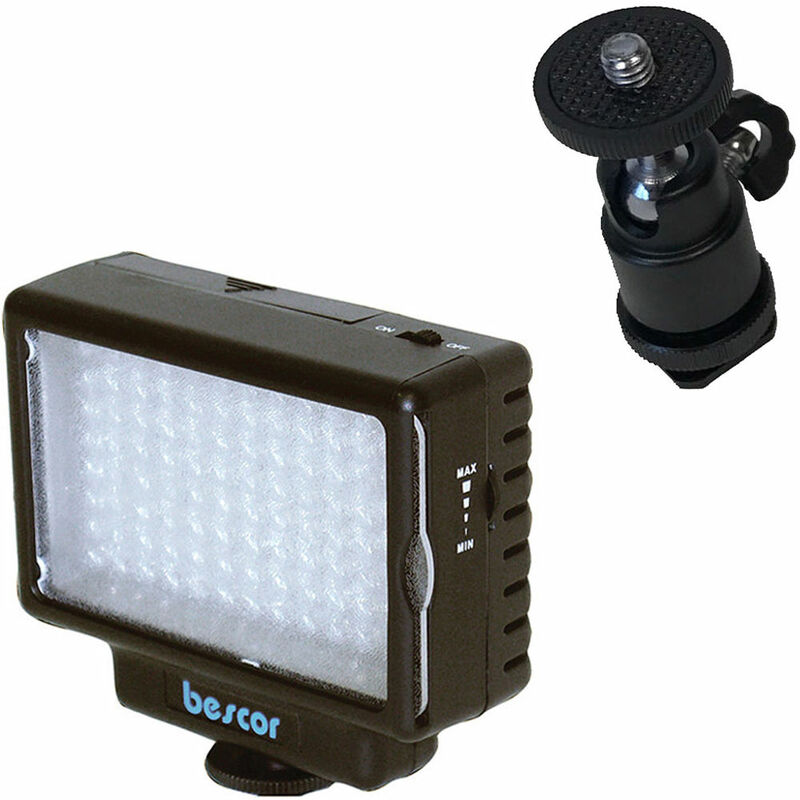 Capable of holding gear as heavy as 2 lb, this Mini Ball Head Mount from Bescor is well suited for articulating small accessories, such as portable lights and microphones. It offers a 1/4"-20 screw at the top for attaching to your gear featuring a notch on its base for 90° tilting in one direction, as well as a durable metal construction. At its bottom is a shoe mount with a 1/4"-20 female thread in the middle, which allows it to be installed directly to the hot shoe of your camera or used with compatible light stands and tripods. Box Dimensions (LxWxH) 5.35 x 4.8 x 2.15"
Box Dimensions (LxWxH) 2.85 x 2.5 x 0.85"